Many people opt-in for removing these animals by hiring a professional, but what about the mess that these animals left behind? How can you prevent further problems? Animals leave a host of microbe-rich material that can cause disease and physical damage. Attic decontamination and pest proofing is a wise investment for any homeowner. For example, you may already know that rodents communicate with each other through the smell of their urine and pheromones. Even after these pests are removed from your attic, their remains may indicate to other animals that it’s a good place to call home! The structure of the attic is first inspected, and all entry points for pests are identified. Debris, insulation or other materials that have been exposed to pest excrement are removed. To avoid airborne contaminates, as a precaution, the area is sprayed down thoroughly prior to removal. Decontamination and sanitizing of the entire attic space helps kill any bacteria, fungi, microbes, viruses and pheromones. Mold and mildew are treated with fog. Attic stair covers and other barriers prevent the transfer of air into your living spaces, usually through small gaps such as electrical holes, wall plates, exhaust fans, plumbing stacks and sheet rock junctions. Duct connections for electrical wiring are covered and protected. A project like attic decontamination is not usually something you want to do yourself. Finding the right professionals for the job can make all the difference. 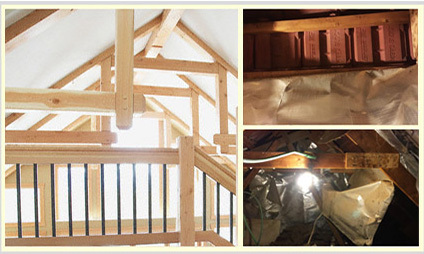 Quartz Solutions is your one-stop shop for any attic and crawl space-related repairs or maintenance. For friendly and professional advice over the phone, call 201-205-2042, 973-536-1013 or request a complimentary inspection of your attic or crawl space.